Would You Like Slides with That? 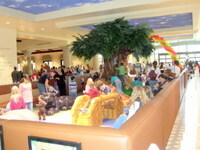 Fast Food Places in Ventura County with Play Areas! Sometimes it's fun to take the kids out where you know they'll be able to burn off some steam after their chicken nuggets and fries. Mind you, my kids much prefer going to a park to play, but sometimes it’s nice to eat and play at these (mostly) indoor play areas. Here are places to eat that have play areas. Know of other places? Well then, give me the scoop (the news, not the fries). 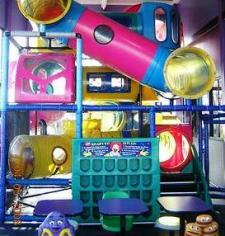 Chuck E. Cheese's in Thousand Oaks and Ventura of course have big time play areas and small/big kids' arcades. Kids World Indoor Playground in Oak Park has an eatery you can chow down at while your kids play in the massive play structures. Most of the local Ventura County shopping malls have kids' play areas, some inside, some outside, and there is always food close at hand. On-Camera Audiences www.ocatv.com - Currently available shows include American’s Got Talent, Beat Shazam, Celebrity Big Brother, Dr. Phil, Rent Live, The Price is Right and more. Audiences Unlimited www.tvtickets.com - Currently available shows include Dr. Phil, Just Roll With It, Last Man Standing, The Big Bang Theory, Mom and many others. TVTix.com www.tvtix.com - Currently available shows include Wheel of Fortune, Jeopardy, The Odd Couple with Matthew Perry, 2 Broke Girls and more. 1iota.com www.1iota.com - The Voice, Talking Dead, The Talk, Jimmy Kimmel Live, The Late Late Show with James Corden, Steve and others. Note: Each show has different age minimums, locations, timing and rules, so make sure to read the fine print. For example, if you want to be on The Price is Right, you must be 18 years of age or older and arrive 4 hours in advance of the 2 hour taping. That could be a long day! Wheel of Fortune, filmed at the Sony Studios in Culver City, however, allows audience participants as young as eight. Looking for laughs around Ventura County? Here are some great options to consider. The Ventura Harbor Comedy Club (located at Ventura Harbor Village), features top-notch comedy five nights a week. Admission is generally $15 plus a two drink minimum. The club is owned by comedians Andy Fernandez and Randy Lubas. Levity Live Comedy Club at The Collection at RiverPark in Oxnard is now open, offering a weekly lineup of stand-up comedy. Jason Love hosts a monthly comedy show, Laugh Out Loud Comedy Night, at the Paseo Camarillo Regency Theater on the 3rd Wednesday night and at the Westlake Village Twin the 1st Wednesday night of each month. Shows start at 7:30pm. Jason also hosts periodic comedy shows at the AMC DINE-IN Thousand Oaks 14 at The Oaks mall, including New Year's Eve and Valentine's Night shows. Tickets at fandango.com or at the box office. Comedy & Cocktails at Studio Channel Islands in Camarillo is another comedy venue hosted by Jason Love on the last Friday night of each month. For information, visit www.studiochannelislands.org or call 805-383-1368. Jason Love also hosts "Live Standup Comedy on the Hill" at the Hillcrest Center in Thousand Oaks. This is a monthly show on designated Saturday nights. And yet another local comedy show hosted by Jason Love is at the Studio Movie Grill at the Simi Valley Town Center at 7pm the 2nd Wednesday of each month. Jason Love hosts a lot of shows, doesn't he!? Check them all out in one place at www.jasonlove.eventbrite.com. Ventura Improv Company, offers improv shows at various Ventura venues, including Bell Arts Factory and NAMBA Performing Arts Space. The Canyon Club in Agoura Hills is known primarily for great music acts but they also have top-notch comedians on hand all the time! Ticket costs vary. Reserve a dinner table and get guaranteed seating! The Thousand Oaks Civic Arts Plaza hosts all types of performances...musicals, concerts, lecture, ballet, dances, plays and, sometimes, comedy! Giggles Santa Paula - Live comedy shows with top talent at the Glen Tavern Inn in Santa Paula. It's sure hot out here! What's there to do around town that will cool me off!? Looking for things to do when its really, really HOT outside!? This list of mostly indoor activities is somewhat random in order so take a close look and you'll find something cool to do in and around Ventura County. These are just a sampling of the various activities and events in Conejo Valley Guide, so make sure to explore and find something fun to do!